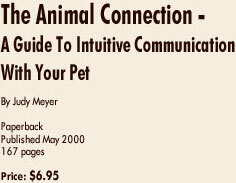 Judy Meyer reveals how you can use your intuitive powers to become more deeply attuned to your pet's needs and desires. 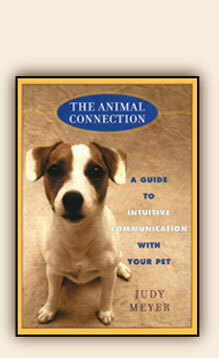 With this one-of-a-kind guide, you'll learn how to hear and understand what your animal is telling you, express your feelings, foster a more respectful relationship with your animal, change bad habits, redirect unacceptable behavior, communicate when you're apart and get back in touch with your intuitive gifts. Plus, there are 9 step-by-step exercises - including learning to see the world as your animal does, recognizing the power of silent communication and moving the focus from your head to your heart…and much more! This jewel of a book covers such a rich subject with wonderfully effective, straightforward simplicity and instruction! Small enough to be a pocket-book. Spiced with single pages of guidance. The presentation makes this an easy way to absorb and use its wisdom. A great gift!